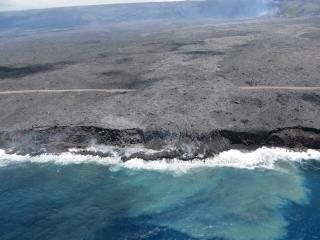 (Newser) – Hawaii's Big Island is getting bigger, and in geological terms it's happening fast. Kilauea, a shield volcano that rose from the sea more than 50,000 years ago, is among the world's most active, and its Pu'u O'o spatter cone has been erupting nonstop since 1983. But not too long ago a new vent opened on the east side of the crater, spilling lava down the southern side of Kilauea, where it crept its way to the sea in a phenomenon not seen since 2013, reports Motherboard. "These fragments accumulate along the submarine slope to form a loose foundation that will eventually support overlying lava flows that build the delta above sea level," the USGS reports. What!!/??? Growing ?? Not shrinking from Gloabal Cow farts.. FLASH!! FLASH!!! FLASH !!!! Volcanic islands grow by volcanic activity! Oh ... you knew that? Never mind. OH!! ... y'know what ELSE ???? There's already another island forming southeast of THAT one!!! Well, it'll BE an island, ... in about ten THOUSAND ... or maybe a HUNDRED thousand years!! Make your reservations NOW!! !